While in Indonesia I was fearful of having culture shock. I hadn’t visited Asia yet and I had all of these preconceived notions of what it would be like. Many were all for nothing and I found that there wasn’t too much of a culture shock for me while there. This was mostly because the people we had touring us around had us staying in the finest accommodations, they shuttled us around in safe transportation and happily helped me avoid any and all squat toilets. I was liking everything I was seeing in Indonesia quite a lot and the food was fantastic as well, going down smooth with no stomach issues, like I had worried about. Any culture shock that there might of been was mild. Until I chose to go on a culinary tour of Yogyakarta that is. 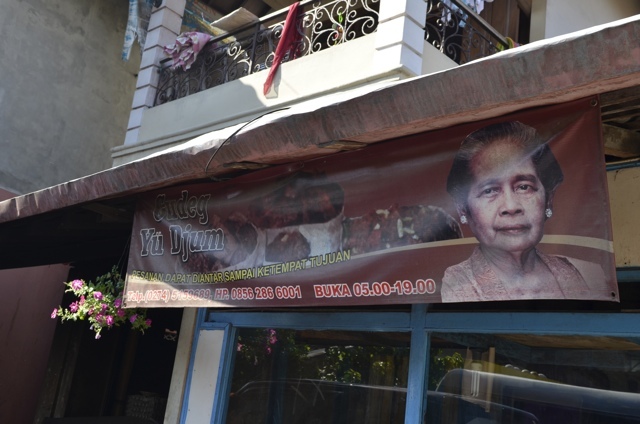 Our first stop on the culinary tour was to a restaurant known as Gudeg Yu Djum. Famous for it’s Gudeg that they sell all around the city of Yogyakarta at street stalls and in restaurants. 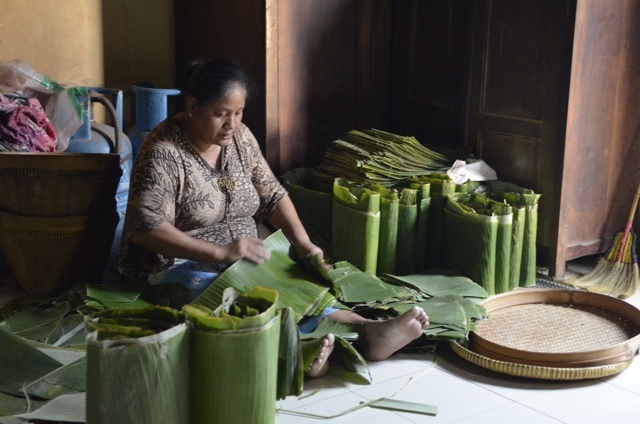 At first I thought we would just sit, try the Gudeg and be told about it and then we were invited to go into the “kitchen” to see how it was made. It’s hard to describe in words what this so called kitchen was like. (view the video above ^) It was an attack on the senses, the noise, the things we saw, the smells, it was like nothing I had ever seen before in my life. The whole back area of the building (consisting of at least 4 or 5 rooms) was filled with people making large amounts of Gudeg. A couple ladies sat on the floor ripping leaves to be used as plates, one man filled large pots with coconut milk, while another carried around shovels full of hot embers stoking the fires beneath the pots. There must of been at least 20 large pots boiling over with coconut milk and jack fruit throughout the whole place. In one of the smaller rooms 8 people sat and squatted on the floor with their hands and arms elbows deep in big tubs of water and chicken guts as they prepared over 300 chickens to be cooked. 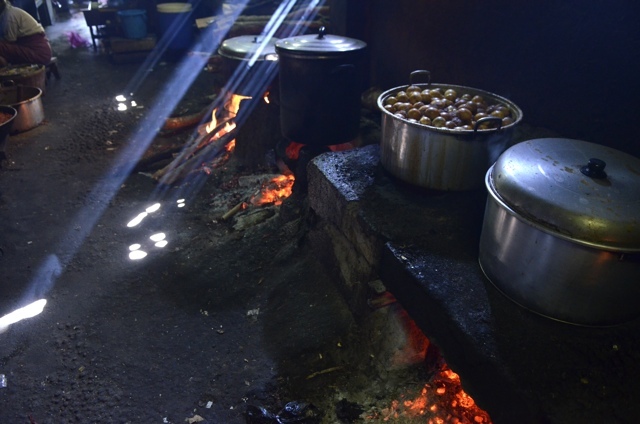 The room next to that room had eggs browned with sugar cooking in multiple pots with smoke and steam rising from everywhere catching the rays of the sun peeking into the darkly lit room. An older lady sat low to the floor making sambal sauce, a delicious Indonesian made condiment. In the alley way through the open door more women sat near to the ground cleaning chicken and watching over even more pots of cooking jack fruit. Back inside near the front of the building a man ground spices with a large mortar and pestle sweating from the intense heat of the kitchen. I began to cry just looking at all of this. Not because of the culture shock but literally because of all the smoke in my eyes. It would take a long time for someone to get use to that. As I sat down in the front of the restaurant the Gudeg was brought for me to try. On my plate was the gudeg (the boiled jack fruit with palm sugar and coconut milk), there was beef skin (exactly what you think it is), one of the boiled brown eggs, sambal sauce and white rice. I tried to collect my thoughts on what I had just seen and tried to put together how that food made it to my plate. This was my culture shock. The room full of people cutting the chicken, was one of the craziest things I had ever seen and it wasn’t expected. The idea of it being unsanitary crossed through my mind and I was glad to see that no chicken was on my plate. To have a kitchen and restaurant like this in Canada it would just not be possible or allowed. I was definitely feeling a disorientation of experiencing a different way of life. However even though this was my thought process I also realized that they have been cooking Gudeg here this way for 4 generations. Yes, its not the cleanest or healthiest way to be preparing food but they must be doing something right to be the most popular Gudeg place in the city. The culture shock of it all quickly passed as I tried my first bite of the Gudeg. It was tasty. Probably not something I would necessarily order if given the choice, but I was happy to have at least tried it once. Have you ever experience culture shock on your travels? Tell me about it in the comments. Thanks Izy! It is definitely something that I would like to go back and see again. Perhaps film in more detail and interview a few of the people and customers. The ladies cleaning the chicken in your video reminded me of an encounter I had with a rooster in Panama. I was walking from the surf to the lunch counter, but had to walk around the one building on the property to get to the food service area. I passed the bird and saw a woman stepping out from the back door of the kitchen. I paid her no mind. By the time I reached the lunch counter on the other side of the building, that same bird was laying on the counter dead, getting plucked. I ordered the fish. Hi Cailin, I am glad you visit my hometown Yogyakarta and tried the most famous food which is Gudeg. 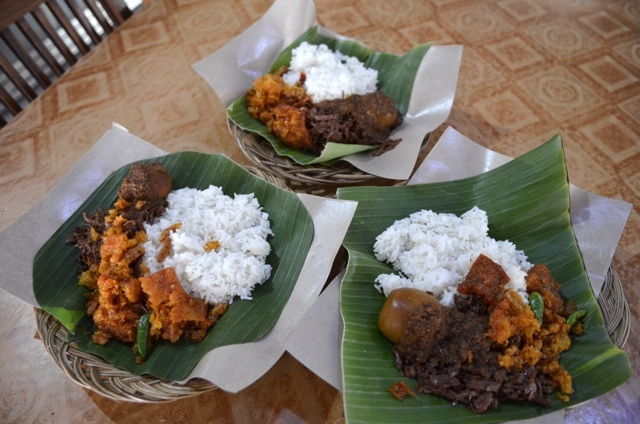 My favourite part of Gudeg is the beef skin, we called it “Krecek”. But yes, i do understand about your experience to see the kitchen because it totally different with your country. But i believe, they also think about the cleanliness of the food before they served it to the costumer. I’m happy to see that you got to try some of the local Indonesian delicacies Cailin. I never tried the gudeg, but I did make it to one of Bali’s best ‘babi gulings’ (suckling pig). Arrive at this house tucked away in the small town alley at 4am for a fresh, traditional-style pig roast. I’ll check out your video!